I just did a short test of running WireGuard on my ASUS RT-AC86U router, following the instructions I found in the Smallnetbuilder forum. Got it finally working with a small changes, to the config and did some speed tests to compare it to my previous OpenVPN speed tests done on the same router. At the same time while testing the max speed with Speedtest.net, the CPU was working up to 100%, using both cores simultaneously. Something which isn’t possible when using OpenVPN on the router. Looking good so far. WireGuard can use multi-cores in the CPU, and OpenVPN can’t. Hoping for more VPN providers to implement WireGuard soon. At the moment (April 2018) I think only Mullvad and AzireVPN do support WireGuard. I wrote an instruction about how to install and run WireGuard on your Asus router. See the link below. 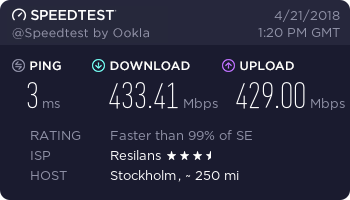 New speedtests with the latest version of WireGuard and connected to Mullvad’s servers in Stockholm/Sweden, achieving partly over 600 Mbit/s.